Ancient grains, hidden veggies and Sol Cuisine's Signature Superfood Blend elevates this classic pub grub to a favorite the whole family will enjoy. Dip 'em in your choice of vegan mayo, spicy ketchup or your favorite sauce for a quick and tasty nosh any time. GMO-free and packed with 14 grams of healthy vegan protein per serving, they're also a good source of fiber and iron. 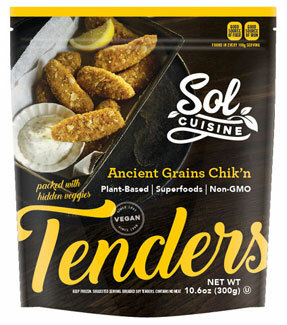 Heat them on the skillet or bake in your oven for perfectly crispy, delicious vegan chik'n tenders any time the urge strikes! Each 10.6 oz. (300g) package contains 12 tenders. $5.99 per package.